Hmmmmmm, where did I go wrong? Suggestions anyone? Should I have used a smaller needle? That’s it, isn’t it? Help a knitta out here. Wow, these are looking gorgeous! I love the colors.But as for the flare: I second danielle’s suggestions of knitting the inside part of the hem on a smaller needle, and also knitting the inside one row shorter (this will pull the picot edge inward, instead of flaring out). I knit my edge on, so I don’t do her third thing, but my picot edges turn out fine this way. I like the suggestions that you got for the flare. 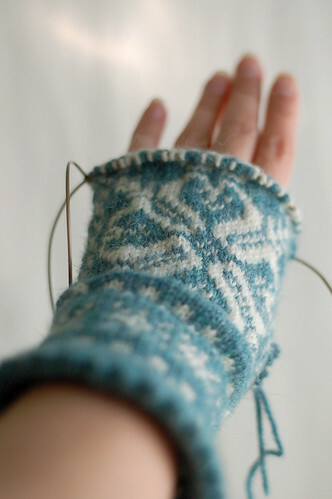 Those mittens are so pretty! 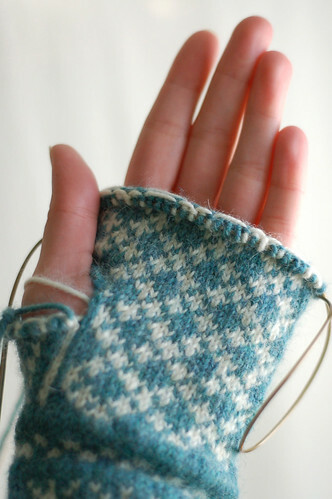 No help on the edging – but those are gorgeous mitts! A tip I got from an elizabeth zimmerman book (I don’t remember which), but she says to cast on 10% less stitches and add them on when you’re at the point where you join the cast on back to the working yarn. Did I explain that well? I’ve always done it that way and it comes out great!